So back in January, just after my birthday, I wrote this post about making a “Twenties Bucket List”; a list of things I wanted to do before turning 30. Take a winery tour. – I did a wine *tasting* in March so… I’m gonna cheat and cross this off. Attend Wine Over Water (not everything on this list is wine-related. Promise). – This event hasn’t happened yet. Lose 40 pounds. – I’m almost there: I’m down 27 pounds. Begin writing a book. – Er… Nope. Not yet. Take 1 photo a day and make a “memory yearbook” at the end of the year. – I screwed the pooch on this one. Begin saving for a family Disney trip. – Kind of? Take a weekend road trip with the family. – No, but we DID go to Chicago for a whole week in the early summer. Meet some of my blog friends in person (FINALLY). – Not yet. But I did get to meet two other people who write for Nooga (and we had a blast at karaoke), so maybe that counts? See a live concert (preferably Mumford & Sons or Edward Sharpe & the Magnetic Zeros). – YES. I did see Edward Sharpe, and am seeing Mumford & Sons next month. 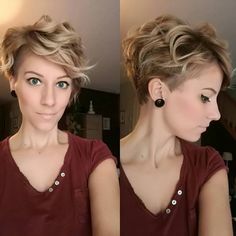 Do something completely different with my hair. – YUP. Take a look. Run a 5k. – I ran the Color Me Rad (didn’t run the WHOLE thing but I ran most of the way) in March. Mentioned that I wanted to do the Run For Your Lives 5k, which I’m doing next month (if you’re planning on doing one, don’t forget you can get 15% off using my special Zombie Prep Team code of ZPTD10). Okay so looking at the list there aren’t quite as many things crossed off as I originally thought, but that’s okay. I’ve made good progress and am exciting about the things that are still to come. Also? The thought of chopping my hair off was scarier than the actual chopping itself. Once my stylist made the “point of no return” snip, I was strangely calm about the whole thing. I’m not sure if I was in shock or what, but I was totally fine with her hacking off most of my hair. Five months ’till 30. Lets see if I can get more of this bucket list taken care of by then! You look fantastic! Congrats on the weight loss – that’s a huge accomplishment! B recently posted..Nursery Update: Nearly Finished! wholesale Iphone Case, best supplier from china Iphone Case shop with free shipping and competitive price with best service. If music had not been a crucial element in human survival, it would have become extinct lengthy ago. Don’t overcrowd your wedding day reception tables with excessive flowers. print that outlines neighborhood attractions, the most beneficial restaurants, and hotels. to make correct online bookings.